Learn how to use the Est Quarterly Tax sheet to help you plan for your quarterly self employed earnings taxes in the year ahead. 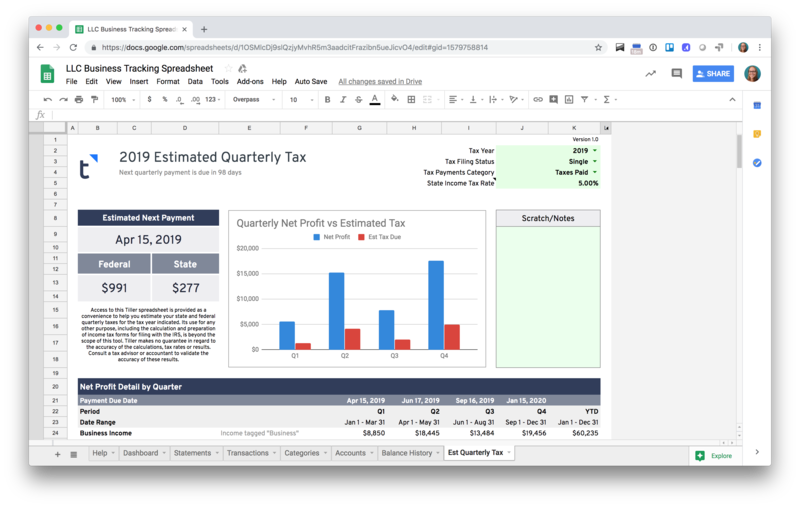 Tiller’s Estimated Quarterly Tax sheet helps freelancers, consultants, and other small businesses estimate and forecast their quarterly taxes in real time. It’s a great tool for those who are required to pay taxes quarterly and do not have a job where taxes are automatically withheld from their paycheck. The tool is not recommended for those with complex tax situations, those who may be subject to Alternative Minimum Tax, multi-member LLCs, partnerships, or LLCs taxed as an S-Corp. Review the Assumptions and Expectations section below for more information about how to use this tool. Note: The intent of the tool is to provide estimates. Tiller makes no guarantees in regard to the accuracy of the calculations, tax rates or results. Consult with a tax advisor or accountant to validate the accuracy of the results. Review the Assumptions and Expectations section below for more information about how to use this tool. 1. Add the tags column to your Categories sheet using the Tiller add-on. The Tags column in the Categories sheet allows you to assign one or more tags to a category, and subsequently all the transactions that have the category applied. Each category that is a business expense should be tagged “business. ”The Tax Estimator sheet looks for categories tagged as “business” when calculating net profit to get your cumulative taxable income. You can add the Estimated Quarterly Tax sheet to any existing Tiller-powered Google Sheet that has a Categories sheet. 4. Configure the sheet based on your tax situation. Set your filing status, the tax year, and other important details that are specific to your tax situation and the sheet will start calculating your estimated quarterly taxes as your transaction data flows in.